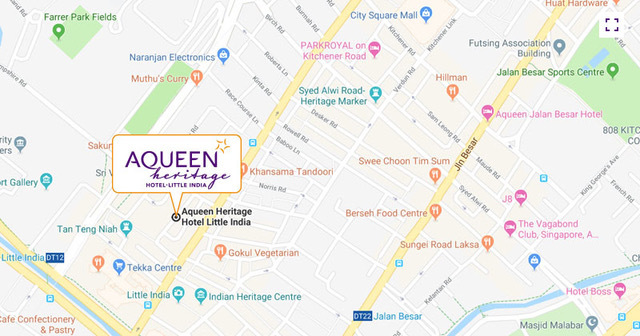 Aqueen Heritage Hotel Little India is situated right in the heart of Little India, making it a prime spot for guests keen on immersing themselves in the local Indian culture. Little India is home to a unique multi-sensory experience – from elegantly-restored architecture and landmarks, to an immeasurable array of signature delicacies and intricate paraphernalia. Singapore Changi Airport is easily accessible with many modes of transportation available to and from the Airport. For drivers, car parks are available at every Terminal of the airport as well. Aqueen Little India Hotel is conveniently located and well-connected to the Singapore Changi Airport and also to the local transport network. You can reach the hotel using MRT Public trains and the ride to the closest station “NE7/DT12 Little India” takes around 41 minutes. Take the west-bound MRT from Terminal 2 to Tanah Merah station and transfer to the west-bound train to Joo Koon. Alight in Bugis station transfer to the downtown MRT to Bukit Panjang. Alight at Little India station. The hotel is a 4-minutes walk from the station (350m). Estimated waiting time for Airport Shuttle is up to 15 minutes during peak hours (6.00am - 9.00am and 5.00pm - 1.00am) and up to 30 minutes during non-peak hours. The journey to the city centre will take approximately 50 minutes under normal traffic conditions. From the airport basement, take bus 36 towards Stamford Rd - Singapore Management University (Smu) (04121). Bus Station. Alight at Stamford Rd – Singapore Management University (Smu) bus stop (25 stops). Then take bus 131 or 147 or 857 towards Seragoon Road Tekka Centre and Bus Stop. A 4-minute walk from the bus stop to the hotel. There are also options to take the Public Bus Service, and if you wish to do so, tourists can take bus service number 27 from the airport basement towards Hougang Central Interchange. Alight Tampines Ave 5 - Blk 938 (76061) (4 stops). Walk to Tampines Ave 5 - Blk 147 (76069) (3min) (150m). Take bus 23 towards Tampines Interchange and travel to Seragoon Rd - Tekka Centre (07031) (20 stops). Buses: 67, 857, NR6, 23, 64, 65, 66, 131, 139 and 147 (along Belilios Lane).